Cell proliferation can be used to assess normal cell health, to measure responses to toxic insult, or as a prognostic and diagnostic tool in several cancers. The available markers typically look at DNA levels or synthesis, cellular metabolism, or proliferation-specific proteins. This guide highlights the most common methods to mark and score cell proliferation. Below are some of the best methods used to study cell proliferation. We’ve highlighted in green our recommended techniques for each method type. For investigating cell proliferation in fixed samples, we suggest using Ki67 because it is well-established and highly-cited across both the basic and clinical research areas. MCM-2, another proliferation marker, is steadily gathering data around its use a prognostic marker in certain cancers, making this something to pay attention to as the research continues. For live cells, EdU is the preferred choice. Insoluble in water – needs to be dissolved in a solvent. The most reliable and accurate method of assessing cell proliferation is a measurement of DNA-synthesizing cells. This relies on incubating live cells with compounds capable of being incorporated into newly synthesized DNA. These compounds can then be detected with a reporter. Thymidine analogs are the compound of choice to be incorporated into DNA, substituting thymidine during DNA replication. However, it is important to be aware that these thymidine analogs can lead to mutations and DNA damage in some instances and thereby affect the cycle cycle1,2. This method is suitable for immunohistochemistry (IHC), immunocytochemistry (ICC), ELISAs, flow cytometry, and some multiplex assays. Combining IdU and CldU allows for time course studies when studying DNA replication by sequential labeling. Immunohistochemical analysis of formalin/PFA-fixed paraffin-embedded sections of Ramos cell line xenograft tissue sections using an anti-BrdU antibody (ab1893). 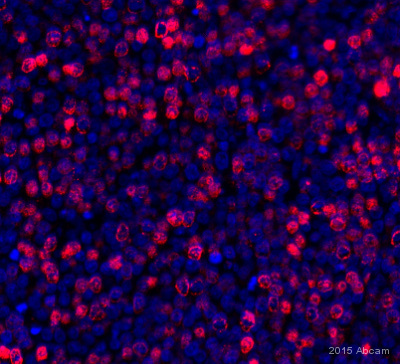 Immunohistochemical analysis of paraffin-embedded colon tissue from IdU injected mouse, labeling IdU with an anti-IdU [2F8] antibody (ab187742). Can be used to study DNA replication fork progression rates, stability, or origin firing by sequential labeling with CldU and IdU. NB some anti-BrdU antibodies cross-react with CldU (but not IdU) and some with IdU (but not CldU). These should not be used in conjunction with BrdU. BrdU assays (left) needs the DNA to be denatured in orderto allow an anti-BrdU primary antibody access to the BrdU molecule. EdU assays (right) rely on 'click' chemistry, in which the fluorescent azide can freely bind the EdU molecule. Rather than looking at DNA synthesis, it is possible to assay cell proliferation by measuring the metabolic activity of your cells in culture via tetrazolium salts. These salts form a dye when present in a metabolically active environment. The resulting color change of the media can be quantified in a spectrophotometer, giving an indication of the extent of proliferation. Although sensitive, some of these salts are insoluble in normal culture medium, and the dye crystals often need to be dissolved in a solvent like DMSO or isopropanol. However, others are soluble in culture medium and nontoxic. Another method to study cell proliferation is by looking at specific proteins that are expressed in proliferating cells, but absent from non-proliferating cells. This requires the use of specific primary antibodies against the antigens expressed during proliferation. These antigens are typically expressed in the perinuclear or nuclear interior regions across all cell cycle phases except G0, making them excellent cellular markers for proliferation. Ki67 is a very popular proliferation marker and is routinely used in pathology labs due to its diagnostic and prognostic power in cancer. PCNA is another common marker, yet multiple studies have shown that Ki67 is more sensitive and specific when evaluating cell proliferation in tumors from various origins3–6. A maker growing in prominence is MCM-2, and recent work suggests this may be a better choice for informing cancer prognoses than Ki67 and PCNA7,8. However, much of the data is inconclusive regarding a ‘best’ maker of proliferation, especially in a clinical context. These immunoassays are excellent for fixed tissue samples and analysis by IHC. Immunohistochemical analysis of frozen sections from adult zebrafish intestine, labeled with an anti-PCNA antibody [PC10] (ab29). Immunohistochemical analysis of formalin/PFA-fixed paraffin-embedded sections from mouse spleen, labeled using an anti-Ki67 antibody (ab15580).